Be ready for the important details such as the MCTN, Exact amount of the money, Name of the sender, Address of the sender and your Unionbank EON account number. Call 841-8600 then dial 7. The UnionBank Customer Service Representative will assist you in the Unionbank Western Remittance transaction. You will be asked important account details for your western union remittance and they will also verify your Unionbank EON account. Within five minutes, the transaction will be completed and you can immediately check your Unionbank EON account that the money was credited. As of 4/27/12, the US dollar exchange rate of Unionbank Western Union Remittance is $1:Php41.81. There is approximately Php6.00 deduction from the total amount which is said to be the documentary cost of the remittance process. This is the easiest way to receive money from western union if you have the Unionbank EON account. Less hassle, no need to travel and very convenient to do the transaction in the comfort of your home. 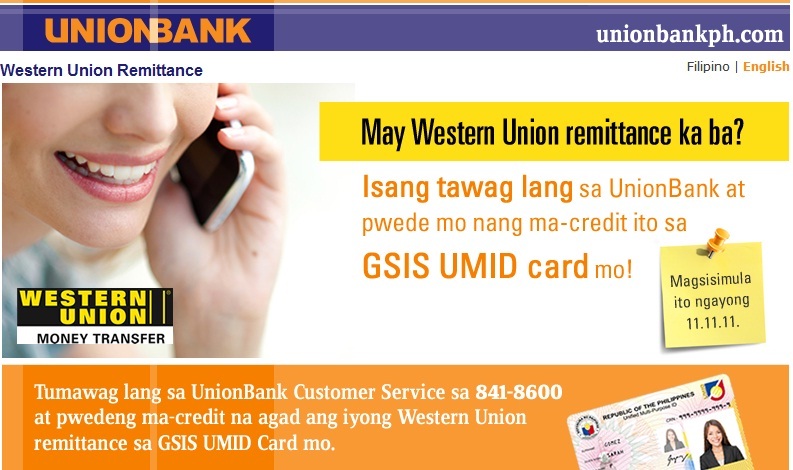 This entry was posted in Google Adsense and tagged Easy Unionbank Western Union Remittance, easy way to receive Google adsense payment, Google Adsense Payment through Unionbank, Google Adsense Payment through Unionbank Western Union Remittance, Google adsense received payment, Unionbank Western Union Remittance. Bookmark the permalink. Glad you have successfully tried it! Congratulations!! Thanks Mommy Rubz. I am so happy now that I was able to cash out every two months for my adsense. With Unionbank Western Union Remittance, receiving money is very easy to do.